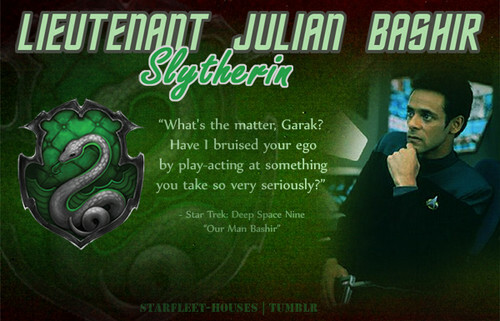 Julian Bashir - Slytherin. Bashir is incredibly intelligent, which might put him in Ravenclaw - but one has to remember Bashir’s intelligence is fabricated through eugenics; through cheating.He is very ambitious, constantly working on papers. Wallpaper and background images in the estrella Trek: Deep el espacio Nine club tagged: deep space nine star trek ds9 julian bashir alexander siddig trek meets hogwarts humans. This estrella Trek: Deep el espacio Nine fan art might contain animado, cómic, manga, historieta, anime, and dibujos animados.